The HP LaserJet 1160 is a laser monochrome printer that is a good choice for a small or home office. It has an inbuilt RAM of 16 MB which cannot be expanded further. It prints at the speed of 19 pages per minute approximately and with a maximum printing resolution of 600 dpi. The HP LaserJet 1160 is quite bulky and weighs 29.6 kgs approximately. It is 10.1 inches in height, 14 inches in depth and 13.8 inches in width. The input tray has a capacity of 250 sheets. The HP LaserJet 1160 Toner Cartridges have a monthly duty cycle of 10,000 pages. It can handle a wide variety of media such as envelopes, transparencies, labels, plain paper, heavy-weight paper, cards and recycled paper. Both USB and parallel interfaces are provided with the printer. The HP LaserJet 1160 can work on many different types of operating systems and is Mac, PC and Unix compatible. It has a sound emission of 55 dBA. The processor speed of this printer is 166 Hz. 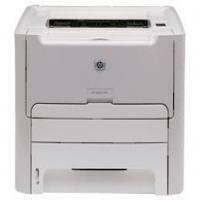 The HP LaserJet 1160 is a laser printer and is suited to work for a small office. This printer has a great output quality and is very efficient in paper handling. It can print on a wide variety of media types and the yield of replacement HP Laserjet 1160 Toner Cartridges is quite high. But the problem with the printer is that it is quite slow in printing and is expensive for personal use. Also, the RAM is insufficient and cannot be expanded. Q. What are the media types HP Laserjet 1160 printer can handle? A. HP Laserjet 1160 printer can handle a wide variety of media such as envelopes, transparencies, labels, plain paper, heavy-weight paper, cards and recycled paper. Both USB and parallel interfaces are provided with the printer. Q. What is the sound emission of HP Laserjet 1160 printer? A. The sound emission of HP Laserjet 1160 printer is 55 dBA (decibels). Q. How to replace the HP Laserjet 1160 Toner Cartridge? Push the button to open the print-cartridge door, and then remove the print cartridge. Remove the new print cartridge from the bag. Place the used print cartridge in the bag for recycling. Grasp both sides of the print cartridge and distribute the toner by gently rocking the print cartridge. Bend the tab on the left side of the cartridge until the tab breaks loose. Pull the tab until all the tape is removed from the cartridge. Place the tab and tape in the print-cartridge box to return for recycling. Align the print cartridge with the tracks inside the product, insert the print cartridge until it is firmly seated, and then close the print-cartridge door. Installation is complete. Place the used print cartridge in the box in which the new cartridge arrived. See the enclosed recycling guide for recycling instructions. Q. What happened if I am unavailable to take my order for compatible HP Laserjet 1160 Toner Cartridges on time? A. We attempt two deliveries at your doorstep on Monday-Friday between 9am-5pm. After two unsuccessful deliveries, the order would be returned to our warehouse and any further delivery attempts will be charged in accordance with our Return Policy. Q. Can you help me find the list of printers compatible with HP Laserjet 1160 Toner Cartridges? A. You can find the list of printers that are compatible with these cartridges on our website https://printerinkcartridges.ie/hp-q5949a-toner-cartridge. Q. Can I mix one of your Cartridges with the OEM cartridges in the same printer? A. Yes, the cartridges we supply are compatible to work with the OEM cartridges. Q. What are the dimensions and weight of the HP Laserjet 1160 printer? A. The printer is quite heavy in weight and weighs up to 29.6 kgs. The dimensions of the machine are 10.1 inches in height, 14 inches in depth and 13.8 inches in width. It carry the input tray with the capacity of 250 sheets in a single tray. Q. What media types are supported by this printer? A. One can print on cards, envelopes, heavy-weight paper, labels, plain paper, recycled paper, transparencies. Q. What should I do if I experience the print quality issue using the HP Laserjet 1160 Toner Cartridges that I purchased from this site? A. If you face print quality issue, firstly we would recommend you to clean your cartridge area or look for any clogged printheads. If you still face same issue and even replacing the cartridges does not solve your problem, simply call a customer service representative and notify about the problem you face with the printer. Q. How can I make sure that your compatible HP Laserjet 1160 Toner Cartridges will work efficiently well with the printer? A. The compatible cartridges supplied would work equally efficient as the original ones do. Make sure that the nozzle heads of the printer are cleaned so as to print clear printouts. If you are buying multipack of the cartridges make sure they are stored properly. Before you print, check the ink level in the cartridges. When all the conditions are appropriate, the toner cartridges will work efficiently with the printer. Q. Do you sell the cartridges for HP Laserjet 1160 printer? How can I track my order? A. Yes, we do sell original as well as compatible HP Laserjet 1160 Toner Cartridges on this site. Once you placed the order, you will get the unique order ID with which you can track your order with our courier company.